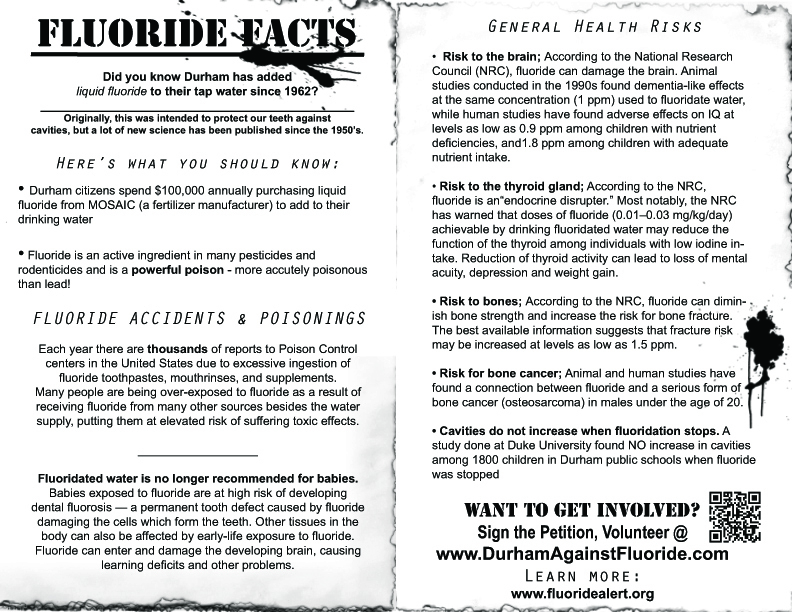 Durham Against Fluoride is an awareness blog designed to provide a chronological documentation of my effort as an individual to end the practice of community water fluoridation in Durham, North Carolina. As such, one only has to browse chronologically all the posts made on the main page to follow start-finish what I have done to try and change the minds of those in government about Fluoridation, a practice I know to be poisonous and deleterious to the health of everyone. 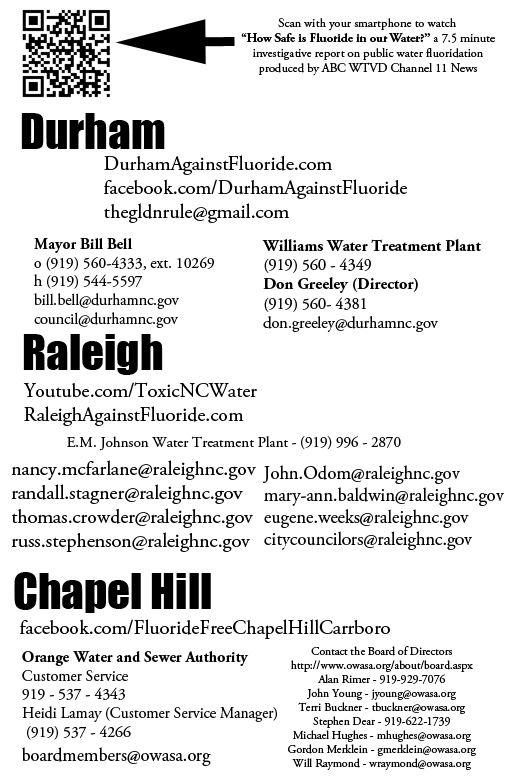 As of this writing I have been unsuccessful ending Fluoridation in Durham, so this site is merely a way to inform and motivate people to take action themselves. So I have designed this page to provide material and ideas how you can spread the word. The most important thing is that you do something. If you are reading this and want to take action it would be incredibly lazy not to send links to people you know. That’s a start! 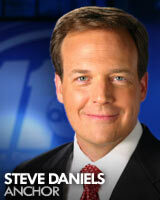 November 15, 2012 ABC Affiliate WTVD Channel 11 – How Safe is Fluoride in Our Water? While e-mailing isn’t exactly the same as attending city council – it is better than nothing! More effective than an e-mail…Printable Flyers! Due to our efforts, the media has taken notice! On November 15, 2012 ABC affiliate WTVD Channel 11 aired the following 7.5 minute investigative piece on the evening news. I want to involved with the fight against Fluoride Movement!!!! 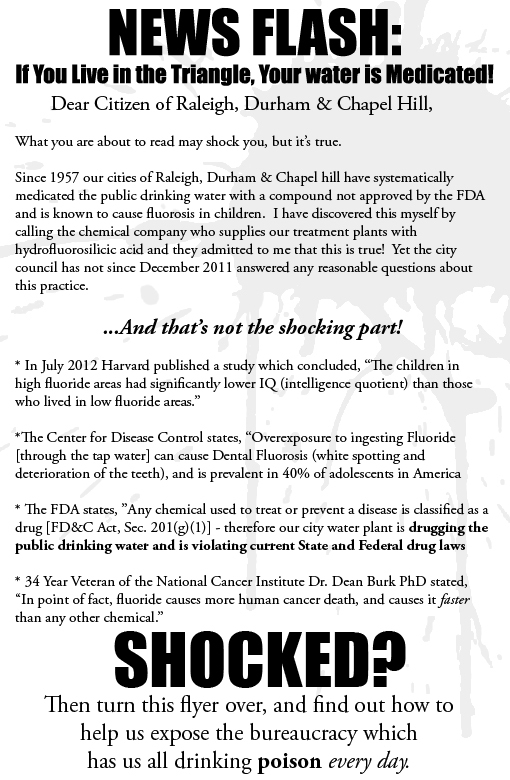 I would like to get involved in the fight against fluoride!! !